In 1980 UCLA Extension developed the Horticulture & Gardening Certificate, with the help and guidance of Mildred E. Mathias. Since that inaugural quarter, the program has several thousands of people throughout the Los Angeles area, looking to pursue their gardening and plant passions. Located in an area where most anything grows, UCLA Extension offers a unique opportunity to get horticulture and gardening experience year round. Our courses are designed for people who want current and relevant industry information combined with the integrity and quality of a curriculum approved by the UCLA Academic Senate. Current and relevant knowledge is essential for both working and aspiring landscape and design professionals. Specializations help focus a course of study so that students gain the necessary in-depth knowledge need to succeed. Interested in gaining more information in specific area? List below are the current specialization and certificates offered through UCLA Extension’s Horticulture & Gardening Program. Students pay for specialization courses on a per class basis. Courses designed to accommodate the schedules of busy working professionals. Our courses are primarily held in the evenings and on weekends. Most courses meet one evening per week. Certificate can be started any quarter. Complete your certificate at your own pace and you can enroll in as many or as few courses as meet your needs. Those who wish to pursue a certificate can complete their studies in as little as 15 months. 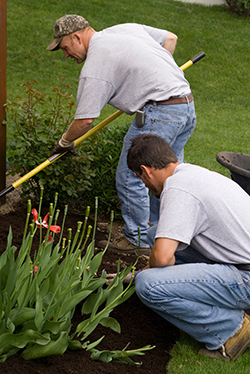 New courses and instructors are added regularly to provide the most current information and contacts within the landscape industry. Many courses include field trips to local private and public gardens, nurseries and landscape companies. Many courses include hands-on applied learning. Not looking to earn a certificate or specialization? That’s okay. You can enroll in any and all courses without being a certificate student.